The detection of nucleic acids has become increasingly important for a variety of analytic and diagnostic applications. In this respect, the development of fluorescent probes has been thoroughly investigated : we show that a careful molecular design can lead to optimised labelling properties, as exemplified in the first part of this report. On the other hand, label-free DNA detection methods are also highly attractive, one way consisting in exploiting the charge transfer properties of DNA. Towards better understanding of the conduction properties of single DNA molecules, we have developed Scanning Tunnelling Microscopy experiments on DNA monolayers, as developed in the second part of this report. 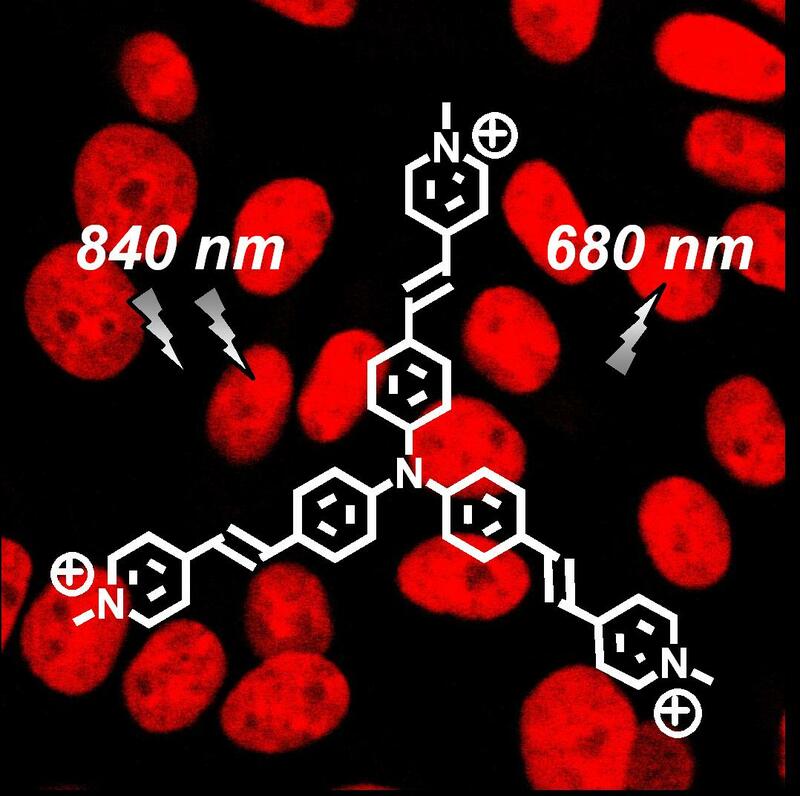 In the search of efficient probes for biological imaging, organic dyes with increased two-photon absorption (2PA) cross sections and large upconversion fluorescence yields have generated much interest . We propose here the use of specifically engineered molecules bearing an octupolar triphenylamine (TP) e--donating core endowed with pyridinium cationic acceptors (mono-, bis or trisubstitution). The wavelength dependent 2PA excitation spectra of the different dyes were obtained following two-photon–induced fluorescence measurements using fluorescein as a reference. Large two-photon absorption cross sections (d)could be measured (up to 700 GM). Most importantly, these compounds happen also to be weakly emissive in buffer medium whereas a strong fluorescence signal is induced by addition of DNA, making them very interesting candidates for DNA labelling and high contrast 2P microscopy . STM study of DNA immobilization. Together with pursuing such studies, next step will now consist in performing complementary experiments of tip induced luminescence in fluorescently labelled DNA : for this purpose, investigation of the photoemission property changes relative to fluorescent probes interactions with their environment (quenching and enhancement phenomena) will first be investigated. Retro-engineering rules will be drawn towards further optimisation of the probes and higher resolution multiphoton microscopy imaging. D. Beljonne et al., Adv Funct Mater., 12(9) 631 (2002) - W.R. Zipfel et al., Nat Biotech 21, 1368 (2003). C. Allain et al., ChemBioChem, in press (2007) - C. Allain et al. Brevet FR0654837 (2006). M. Grubb et al., J. Am. Chem Soc., 128, 7734 (2006). Van Zalinge et al., ChemPhysChem., 7, 94 (2006). Refs therein.